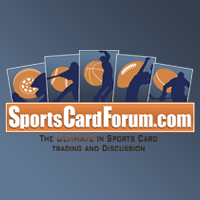 Upper Deck's fun premium brand has hit the store shelves! SPx has been around for a very long time, and during its run SPx has gone through many changes. I'd say it's one of Upper Decks most consistently changing products in terms of identity. It's gone from over-the-top outlandish looks to much more subtle, almost SPA-like, designs. I'm interested to see what this year's SPx is all about. 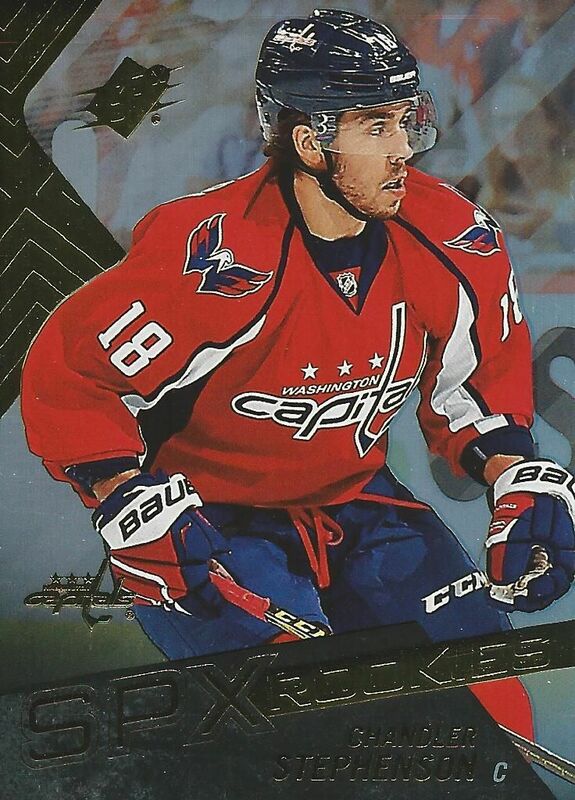 Take a look with me as I open up one hobby box of 15/16 Upper Deck SPx. I was very curious to see what the SPx base design would be like. Would it be a sparse modern look, or would it be something with a lot of flair? It turns out it would be neither of those. The end design is something in the middl... and it looks really, really good. This year the designers at Upper Deck have crafted a very well-balanced base card for SPx. There is a lot of graphical design elements in the card, but they are not overwhelming or distracting. The colors used match team-colors nicely and the logos and badges are perfectly placed. I really enjoy these cards quite a bit. In terms of card stock, the SPx cards come in on the thinner side, but they have a high-quality feel to them. I've got to give it up to Upper Deck for their job on these. Well done. The card back is much more spartan than the front. In fact, it is quite sparse in terms of its design. Sure, the shapes match the front well, but other than that there is very little going on. There isn't even a photo or image of the featured player here! 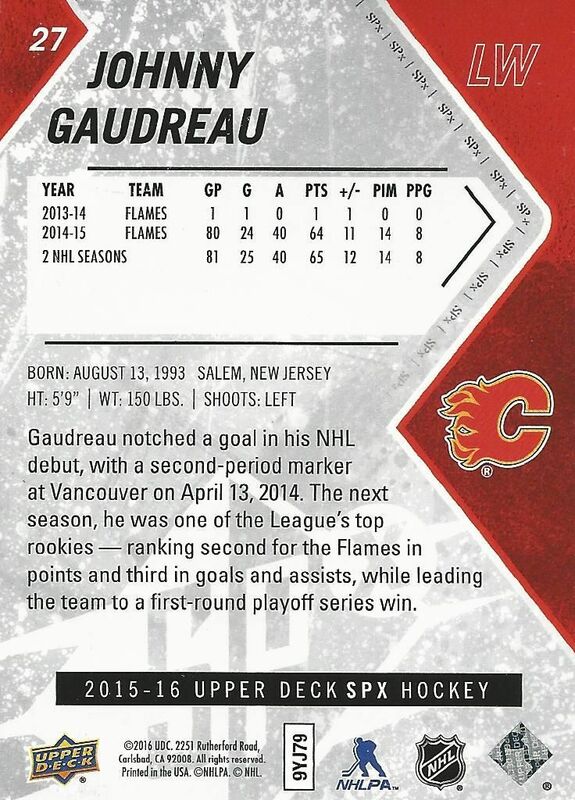 I do like, however, the fact that the card back has a nice write up to go along with the stats of the player. I always enjoy reading card backs as there is a lot of great information to learn from them. SPx comes loaded with foil insert cards that are actually numbered as part of the main set. 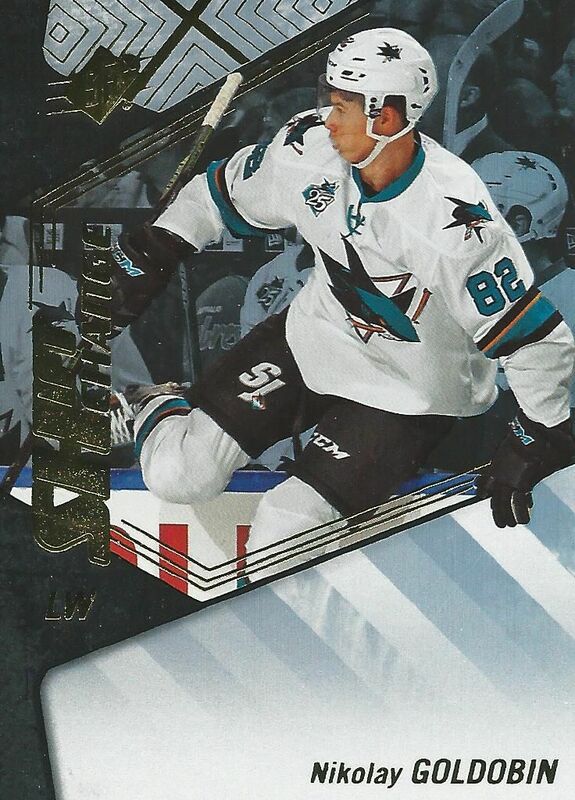 Included are the SPx Foil Rookies, Shift Change, and Stick Wizards and Name on Front inserts, For the purposes of this review, I'll discuss the rookie subsets in the base card design section and the other subsets in the next section of the review. Rookie cards in SPx come in a variety of flavors. Some rookies are just foil cards - like the Chandler Stephenson card shown. These tend to be lower tier rookies that Upper Deck chose to put in for a more comprehensive selection of players. It may well be that one of these rookies may break out and have a nice NHL career. If so, these cards may have some potential value. The Robby Fabri dual patch rookie card numbered to 50 is a variation of the main type of rookie card found in SPx. SPx has always featured autographed rookie jersey cards as their predominate RC, and this year is no different. It is interesting to note that most cards do not have all four 'holes' filled. It's an odd look, as if something were missing. As in years past, these rookie cards have a design that takes advantage of the 'X' in SPx by having it as the main design element on the card. To add to the uniqueness of the card, the player is printed on acetate, which is a sweet little touch as well. I've got to say that these rookie cards are pretty nice looking. It's a design that really does work! Boxes of SPx this year have slimmed down to just 3 hits. The boxes actually remind me more of Artifacts than the traditional SPx box. Upper Deck has seemed to turn SPx into a more mid-tier product this year. As such, collectors can find other mid-tier products within SPx such as Artifacts and Trilogy update cards along with the standard SPx hits and inserts. As I stated earlier, the foil insert cards found in SPx are actually just subsets of the main set. Though they are numbered in the main set, I'll review them as inserts as that's how they feel coming out of packs. The first set I'll look at is the Shift Change subset. These cards focus on a unique aspect of hockey that really doesn't get much mention in cards. 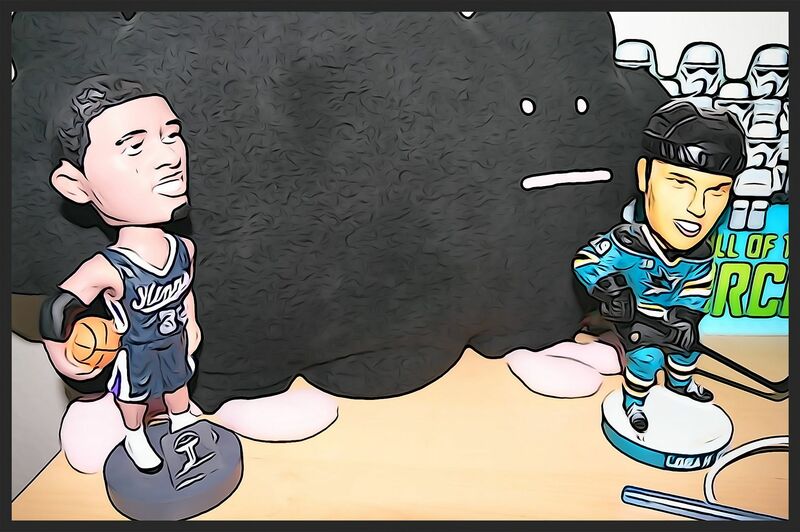 I think it's a fun idea, and it was cool of Upper Deck to find photos of players coming into the game from the bench. These cards all have a large area above the name that seems to be just dead space on the card. To me it looks more like a board with no advertisement on it. If that is what Upper Deck was trying to go for, I think it worked out! Name on the Front insert cards have a more traditional look and feature a large area for the photograph of the player. 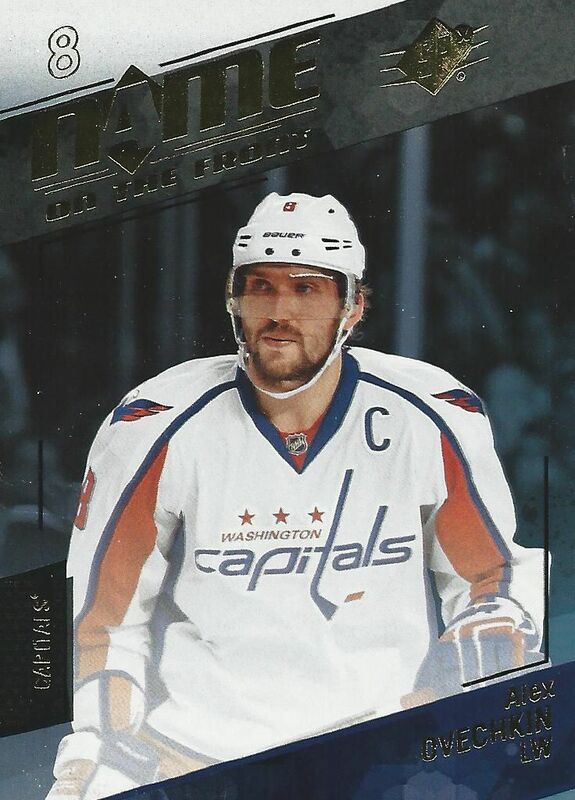 This set seems to focus on players that have been or are team captains. Other than the foil, there isn't much that stands out on these cards. Lucky collectors might find autographed versions of these cards. The auto versions are limited to only 10 copies each - pretty rare cards. Stick Wizard inserts showcase NHLers who have great skill in handling the puck. These cards go with a horizontal design and a fun foil logo. The foreground of the card is in color while the background is more muted. Autographed variations of these cards can be found just like with the other SPx subsets. The Monochromatics jersey set is an interesting addition to SPx. 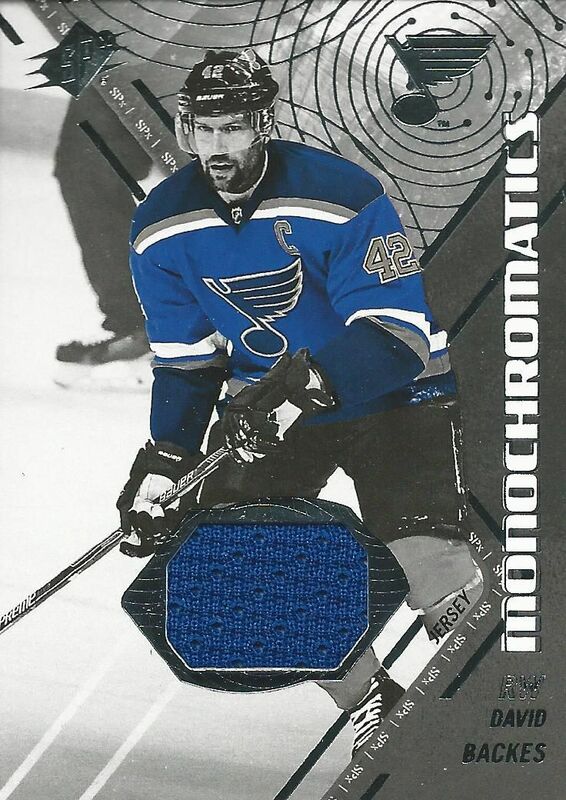 These cards highlight the jersey the player wears by having the entire rest of the card be in black and white. The artsy fartsy lover in me is a big fan of these cards. These cards have a striking look, and I actually had and inkling to possibly try and collect the set of these. Sadly, I don't think there is a patch variation of this set. Besides what I got in this box, SPx is full of different types of hits. Collectors can find retro themed SPx cards as well as Signature Sticks and patch cards featuring multiple players. It's too bad only three hits come per box as there is so much to find within this brand. This year's SPx is a beautiful set of cards. 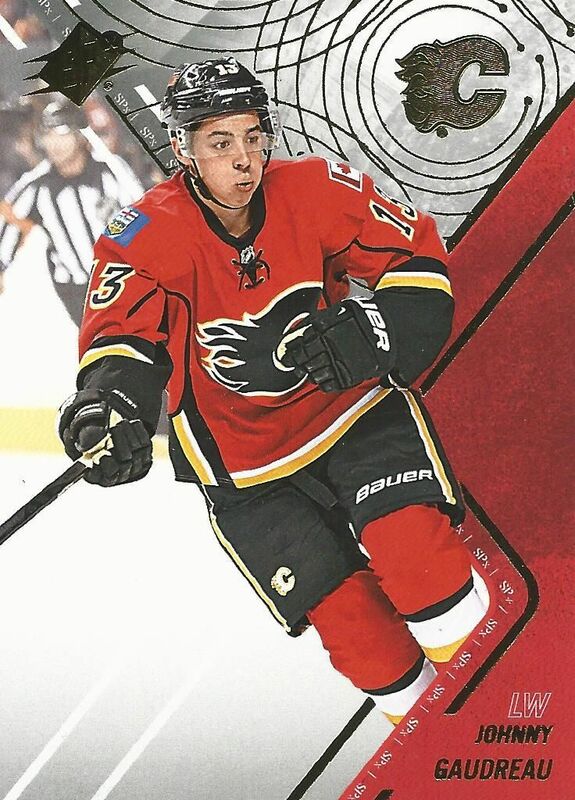 To me, it's one of Upper Deck's best designs for the entire year so far. Upper Deck has changed SPx to be a product that is more like Artifacts. In fact, the box is about the same now. For about $100 collectors can pick up a hobby box and find three hits. That might be a little higher than some would like to pay. I'm a bit mixed on SPx. While I enjoy the cards, the value per box might be a little lacking. You'll have to determine yourself whether or not SPx is worth getting this year. It might be a good idea to just wait until many of the cards hit the secondary market before picking up SPx. I'm sure the prices you find there will be pretty reasonable. Great review! That fabbri card was awesome! I dont know people hate these. Yeah there interesting, but i like that there is more inserts. But i also think upper deck is making every product a hit oriented product so they can make less packs and jack up the price because they are a monopoly. This is why spx is my favorite hockey product! Great review and video as always. Keep up the good videos, because I watch them everyday, and on Sunday I always look forward to your retail reviews. I really like the base card design it's nice and classy. Always like opening SPx and I am very section to grab some this year. That fabbri is DOPE man ! I don't really like the product but that fabbri Wow ! + The Monochormatics jersey set has a very interesting concept. I'm still not sure whether I like it or not, but at least it's way more fun than a common plain jersey card. + The Shift Change set is great designed...to be signed. Without autographs, the white spot isn't that nice. A hard-signed autograph would've made the cards great though. 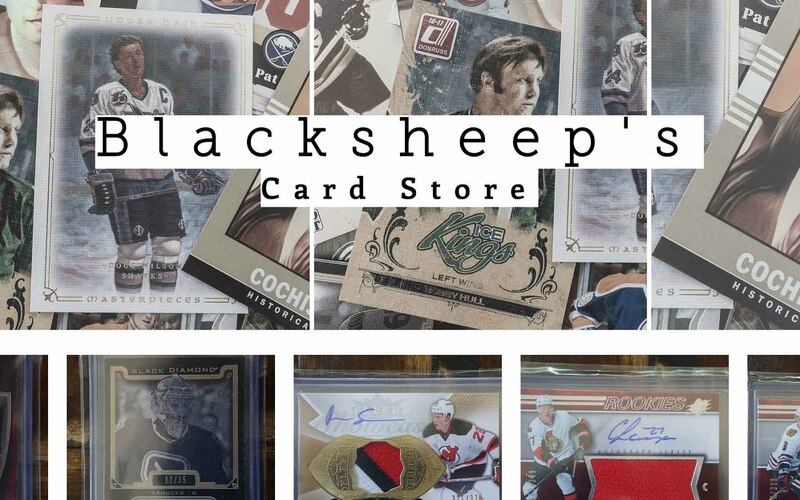 - It feels like a product which UD has overproduced..again... Sure, I understand why they take care of the McDavid hype, but the sad result is that we get a lot of boxes filled with not so exciting cards. - When I first saw the quad jersey rookie cards I thought there was something wrong with the card. Having only two jersey pieces in the holes could be one of UD:s worst ideas ever. Sorry about The Backes card. :( I don't know how that happened. Nice Fabbri that card looks awesome numbered out of 50. Helped a lot, thanks black sheep, love your videos! Thanks for sharing your break, Luke! Congrats on the Fabbri auto patch, but as you have alluded to, it is odd to see that only half of the windows have patches. The price point is fairly steep as well for what the collector "may" receive. The Fabbri RPA saved the box. Nice base card design. A bit pricey for what you get in my opinion. Nice break! Base cards look pretty sweet. 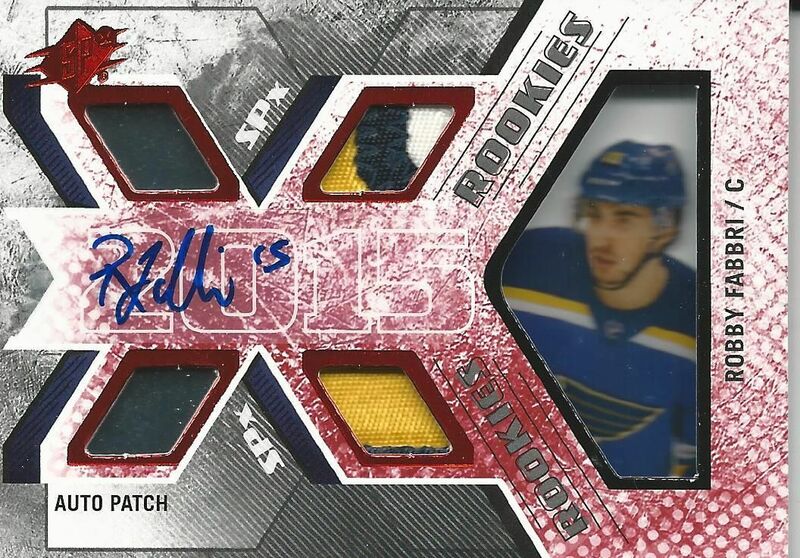 Love the Fabbri patch auto! Decent product, could add more variety! Thanks anyways, Blacksheep!! Not a big fan of this product if you do get the opportunity open more mvp and upper deck tins.I think this product is over rated and sinks.OPEN SOMETHING ELSE!!! Spx is good as always! The monochromatics look really nice! Becoming less and less a fan of Upper Deck... You're buying a box costing 100$+ and you get nothing really out of it. WHERE IS PANINI?!?!?! Nice review btw, keep it up! Looks like a pretty nice products! Awesome design! 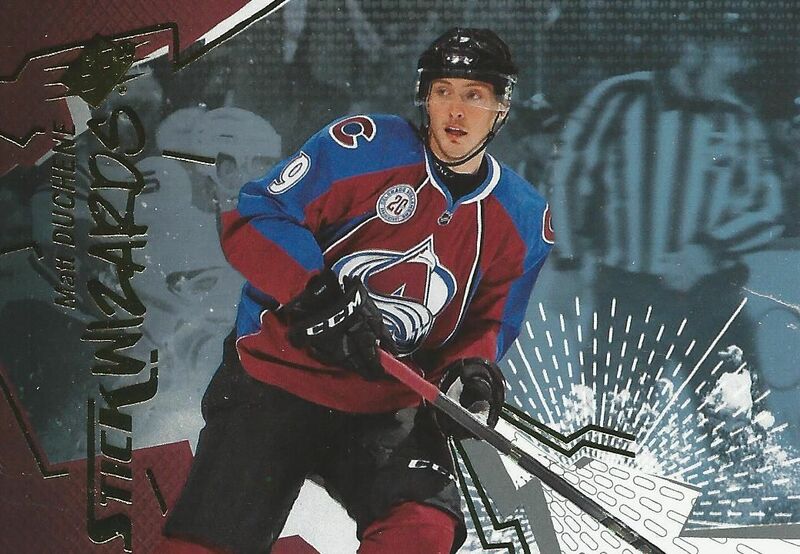 I really like how upper deck didn't change much about spx, unlike black diamond,etc. but still a pretty basic product never the less. Probably the first set I've seen this season I didn't hate. Nice design, and the inserts feel like a nice 90s throwback. Might hang out though to see if these drop to $80 a box. hi I`m bondni183 but I can`t direct message you because of a domain restriction on my account. Can you email me at bondni183@etu.classomption.qc.ca and i will respond you, thank you very much!